Need a Challenge and Reward – Join the SES Today. Severe Tropical Cyclone Veronica Issued at 10:08 am AWST Saturday 23 March 2019. Refer to latest Tropical Cyclone Advice. 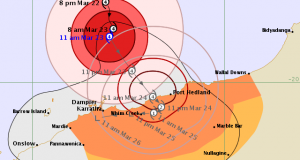 Severe Tropical Cyclone Veronica Issued at 12:12 pm AWST Friday 22 March 2019. Refer to Tropical Cyclone Advice Number 12. Severe Tropical Cyclone Veronica Issued at 3:09 pm AWST Thursday 21 March 2019. Refer to Tropical Cyclone Advice Number 5.